I usually begin a project with unrealistically high hopes and sadly, when working with stones, I almost always screw up. Over the years I’ve tried to ensure that the wax model I make will fit the stone and I’m careful to use delicate movements to retrieve the stone from the wax setting once I’m happy that the setting will work. In the case of these 2 rings though I’ve had to use different, smaller stones after the model has been cast and I’m pretty sure it’s because of shrinkage between the wax model and the silver cast. I’ve never been one to measure twice and cut once but I think it’s time I used my callipers. 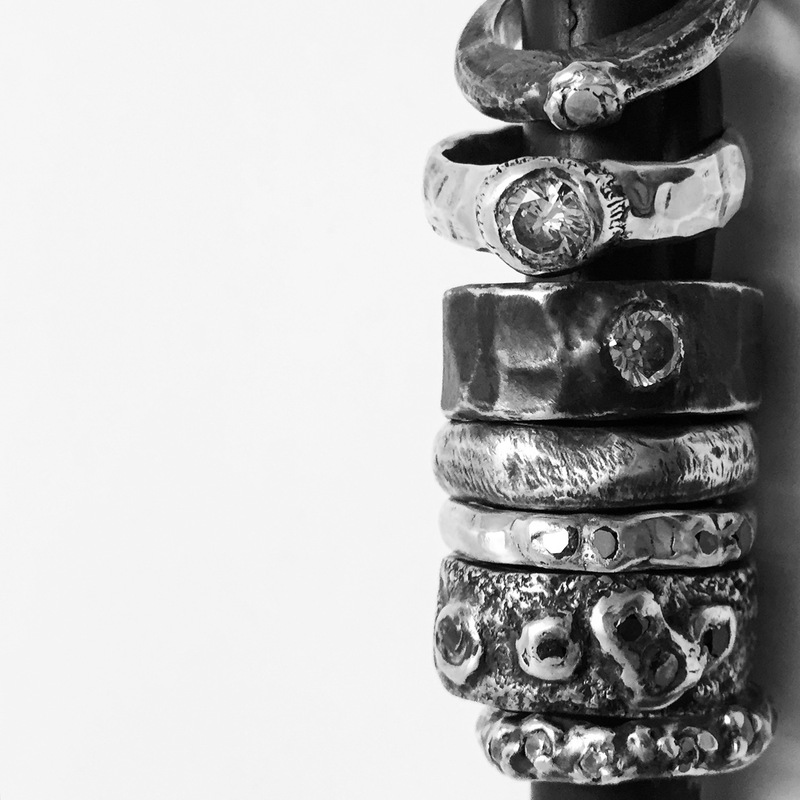 In the meantime it’s back to manipulating silver over stones for a snug and secure fit. Woke up today to no water so I’m already in a bad mood. Hot water tank went down during the christmas break and now it appears the well pump we’ve taken for granted these past 18 years has decided to give up at last. Such is life my mother might say. On a jewellery note however, here’s what’s taking up my thoughts these days…2 pieces of rusted steel I found during a trip to Victoria, BC and a bluey-green CZ I had kicking around. Apparently, my regular solder won’t work to join these together or add prongs to hold the stone, but a brazing stick will. Stay tuned. If you could sneak into the room where I make my jewellery right now you’d probably be surprised at how much of a slob I am, or maybe you wouldn’t (based on the type of jewellery I make). I tend to get excited when I’m in the middle of making bits, jumping around from one idea to the next which means that whatever I grab for one project gets left somewhere on my desk as I move onto the next thing. Who has time to get up from the chair to put a piece of wire away anyway? But I envy people who have pristine work spaces where each set of pliers sits on it’s appropriate hook. And where natural light bursts through large windows onto empty work surfaces where you know amazing ideas will come to life. I’ll have to settle for the odd days when I feel like clearing away some of the clutter on my little desk, for brief moments when I imagine pristine. Adults are fond of pointing out to children that ‘patience is a virtue’. They usually utter these words while raising an index finger in the air because they’re not quite ready or willing to do something that their child has asked them to do. It’s as if they think those 4 words will somehow instill the ability to wait in that young mind. My mother must’ve told me to be patient on a few occasions but I know I never learned how to be so. I had to wait 4 days for my last casting to be done and each day I quietly cursed my casting guy a little more. I imagined him sitting at an imaginary pool somewhere, holding up an icy cold drink and smirking ‘no, your casting’s aren’t done yet, because I’m busy with all this here’. When he called yesterday to tell me they were ready, I dropped what I was doing (preparing for a dinner party for 8 last night), jumped in my car and picked them up. I couldn’t get to them until today though after spending the morning cleaning up the last of the dishes from the party. Here’s the first few items, sawn away from the sprue trees, pickled, filed and brushed to reveal the silver underneath. Patience. Edit : Something got fecked up with the image I used to have here so instead I’m inserting a pic of my latest wax pieces that I’m once again picking up in a couple days, because…patience is a virtue. I started this blog years ago and left it hanging in the middle of cyberspace where I imagine it was floating cold and alone amongst billions of other neglected blogs. Today I’ll try to brush off the cobwebs and share some of the things I’ve been busy with, like sketching and making. 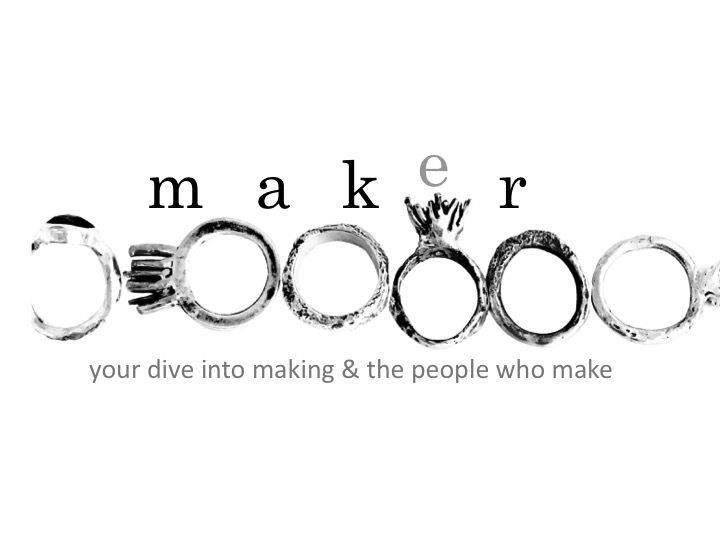 I’ll be sharing progress shots of some of my work and profiling other makers, some well known and others less so. Stay tuned.